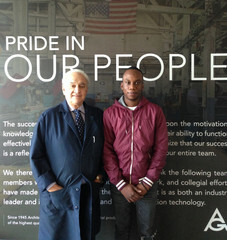 Anthony Giumenta, owner of Architectural Grille, and WHSAD graduate Taivon Edwards. As a result of his four years of technical training in at Williamsburg High School for Architecture and Design, Class of 2014 graduate Taivon Edwards was hired to work in the drafting department of Architectural Grille as a CAD operator. To learn more about Taivon’s experience in the workforce, see the article below or click here.